The Christmas in Manhattan series consists of six books written by six different authors, focusing on five Davenport siblings and one cousin. The stories appear to be standalone reads, with characters from all the books making crossover appearances. 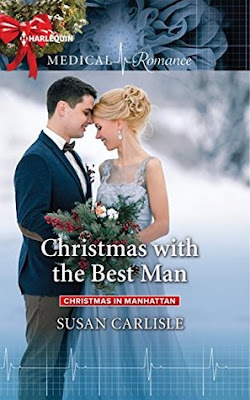 Christmas with the Best Man is the first book I’ve read in the series so I can say without a doubt that you can start reading this series in whichever order you choose. The story starts out with the wedding of Charles Davenport (Elijah’s twin) and Grace Forbes. Their story is told in Sleigh Ride with the Single Dad. Elijah Davenport and Helena Tate are both ER doctors at Manhattan Mercy in New York City. They’ve worked together for years, but there has never been anything between them. In fact, they have never even looked at each other as anything but colleagues until the day of Charles and Grace’s wedding. The two simply want different things. Elijah doesn’t believe in love or committed relationships. Helena wants a forever love with marriage and children. At the wedding, it is clear that they are attracted to each other. Elijah suggests that while Charles and Grace are away for the week they engage in a fling. Helena agrees, thinking that she will just use the time to get Elijah out of her system. She thinks that she will be able to protect her heart since she knows their time together is short and that Elijah doesn’t want the same things as she does. As their week together progresses, the two realize that their feelings for each other are deeper than they ever realized. Things start to feel a little too real and fears buried deep and just below the surface arise, forcing them to make realizations about themselves and their pasts. Susan Carlisle continues to draw me into her stories with multi-layered, likeable characters. My heart broke for the issues Elijah and Helena were desperately trying to overcome. While Christmas is in the title of the book, I didn’t really get a Christmas feel with the story. I wish that we got the opportunity to see Elijah interact with his parents after his revelation. I also wish there was an Epilogue. I would have loved to see how Helena and Elijah were as a true couple and how something important to Helena played out.